Base de Maquillage: Helianthus Annuus (Sunflower) Seed Oil, Ricinus Communis (Castor) Seed Oil, Caprylic/Capric Triglyceride, Cera Alba (Beeswax), Magnesium Carbonate, Kaolin, Candelilla Cera (Candelilla wax), Copernicia Cerifera Cera (Carnauba Wax), SimmondsiaChinensis(Jojoba) Seed oil, Lonicera Caprifolium (Honeysuckle) Flower Extract, Lonicera Japonica (Honeysuckle) Flower Extract, Silica, Tocopheryl Acetate (Vitamin A), [+/- Mica ( CI 77091),Titanium Dioxide ( CI 77891),Iron Oxides (CI 77491, CI 77492, CI77499)]. Mica (CI 77019), Titanium Dioxide (CI 77891), Zinc Oxide (CI 77947), Iron Oxides (CI 77492, CI 77491, CI 77499, CI 77288), +/- Ultramarines (CI 77007). Mica (CI 77019), Titanium Dioxide (CI 77891), Iron Oxides (CI 77492, 77491, 77499). For a light concealer apply the foundation powder over the desired area, for extra coverage apply Makeup Base with a clean finger to the desired area. 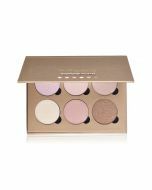 The mineral Warming Bronzer adds a healthy, sun-kissed glow to any complexion and instantly gives your skin a natural-looking tan. Using a light hand, apply to all edges of the face, along either side of the bridge of the nose, and along cheekbones. 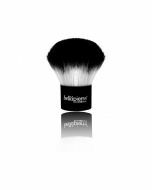 Dust this finely milled Mineral Luminizer anywhere you want to add a shimmery highlight. Typically this is applied on top of cheekbones, underneath brows along the brow bone, on the Cupid’s bow, and tip of the nose.